December 2017 – Earlier this month, ASD administrators, Building 21 leaders, community partners and students gathered in what will eventually become the schools Makerspace for an open house to share what life is like inside Building 21 with prospective students. Now in its third year of operation, Building 21 Allentown has amassed a significant resume of community partners that support its unique curriculum and approach to learning. Building 21 Allentown gives students flexibility and autonomy in their learning. Personalized learning pathways are formed by assessing students’ individual strengths, interests and passions. Learning takes place in the classroom but also in the real world, largely in part to the strong relationships built with community partners –allowing ASD students access to internship, volunteer, and mentoring programs. In the last year alone, students participated in programs with the Baum School of Art, Allentown Art Museum, Digital Feast, IBEW Electrical Union, Lehigh Carbon College, Lehigh Valley Health Network, Lehigh University, Muhlenberg College, PPL the Wildlands Conservancy and the City of Allentown. Building 21 is small by design and demand is high. Each grade level is limited to 150 students, and this fall the school saw over 450 applicants. The project-based learning environment at the school allows students hands-on and in-depth exploration of subjects such as coding, engineering, healthcare, fashion, merchandising, and even urban agriculture. Students who have attended Building 21 shared their experiences with those in attendance. Sophomores and juniors are already looking forward to their future after Building 21, expressing interest a variety of career options, vocational trades, and higher education. 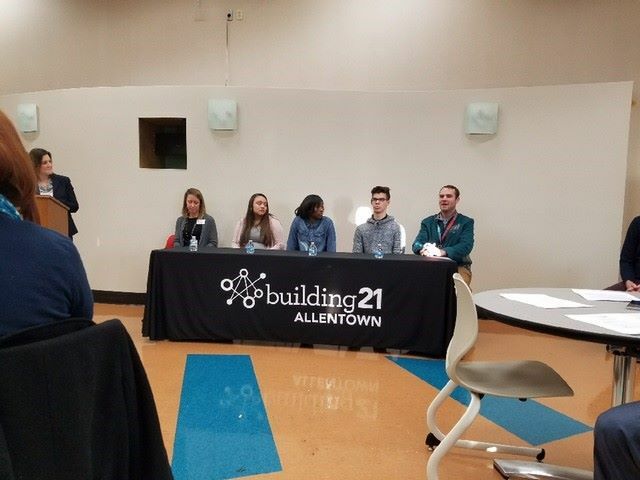 The first cohort of Building 21 Allentown students will graduate in 2019 – and those looking towards graduation have no doubt they will be college AND career ready.